Although they are created to "set off" a bonsai when displayed, each accent plant can be an artistic design in itself. A plant as simple as a grass can make an interesting or unusual counterpart. However, use small accent plants in small containers for a balanced composition and to keep the focus on your bonsai. Coordinate accent plants to be from the natural settings or regions of your trees in order to impart harmonious, natural story-lines. In Japan, three components are often used to make this composition. A drawing, painting, scroll, or Japanese calligraphic artwork may be centered on the wall over the bonsai and accent plant. This 3-part bonsai harmony is contained in its own space so the artistic message of the bonsai is enhanced. A plain wall may be the best backdrop. The above accent plant is a perennial begonia that grows in a flowerbed in Georgia. It has small white flowers and is hardy. Dwarf hostas and other small, unusual plants with or without flowers are good material. A small, delicate, or unusual ceramic pot is used for accent plants; about 3 to 5 inches in width. Something abstract or with a hand-made quality will work well too for the many small flowering plants in nature that are abstract works of art in themselves. Of the accent plants accompanying trees at the National Bonsai and Penjing Museum, the placement we observed was always to the right of the back line of the bonsai pot from the viewing position. The Chinese bonsai example above had been turned for a change of light exposure. 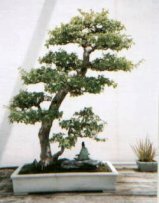 Every bonsai has a front side for design and display purposes. Chinese Bonsai (Penjing) with Accent Plant. Photo taken at the National Bonsai and Penjing Museum. On the forest floor is a Chinese figurine representing a scholar contemplating nature which creates a tranquil scene. Example: Hosta "Blue Cadet", retail nursery; planted in a 5 inch width bonsai pot. Dwarf perennial with lavender flowers on spikes. Ophiopogon japonicus "Nana" Semi-shade groundcover from a nursery center in a 1 gallon pot; slow growth. Ready to be root-pruned and planted to make an accent. Dwarf Sedum, Sedum Kamtschaticum A succulent with star shaped flowers. Very easy, fast growing groundcover for full sun. Its small size is good for accent plantings. Begonia Accent Plant - Designing Bonsai. Accent plants are used to accompany bonsai. The National Bonsai and Penjing Museum at The National Arboretum in Washington, D.C. places accent plants by various bonsai in the museum’s extensive collection. Example below.